When it comes selling, the critical skill required is handling objections. Starting with taking appointments, fix up a meeting, trying to sell a prospective customer on buying your product, pricing discussions, you will have to overcome objections. Importantly, you should plan for these objections beforehand. How? By expecting them, and trying to preempt them. Here are the five key objections for which you should be prepared. Often when you call up or ask for a meeting over the e-mail, this will be a common objection. Foot in the door which is crucial for the next step is hard if you hit this objection. You’ve got to show prospects fast that what you’re offering is worth their time. The solution is to get their attention. Show them with something, promise something, use memorable messages, and/or give prospects value up front. Importantly, the better you understand who your customer is and can speak to their specific needs, the better you will do in getting their attention and getting them to spend time considering your offer. Objection #2: Why do I need you? Particularly if prospects are not actively seeking the product or service you offer, you must show them why they need it. Show them what life can be like with your solution – how it solves a key need or pain. Sometimes you even need to put them in pain, if they don’t know or think they are in pain. For example, while your prospects may be happy with their current CRM, a message that stated “learn the 3 ways your existing CRM is probably not giving you key insights and in turn losing prospects” will make them think they do have a pain/problem and get their attention. This objection comes up earlier than you’d think. It’s partly because people really don’t want to engage or partly from people’s aversion to spending more money on something at all. So “I don’t have the money” is their excuse to bail before getting too invested in the decision-making process. The solution here is to show prospects the value of what they are getting. Explain how your product or service enhance their lives, save them money in the future, position them to be more successful, etc.? Let them know the answer to this question! Likewise, if the prospect is considering an alternative solution to your company which is less expensive, you need to show why it is the best decision to go with you. Winning over the low-cost provider can be only done when you show your product or service value is extremely high! Generally, people are skeptical and don’t believe everything you say or advertise. Before committing to time or money, they want to know you’re for real and they want to see proof that your product or service does what you say. This requires showing to new prospects that you’re legitimate by showcasing credentials, past work, past customers or how long been in business, and anything that showcases the honesty, integrity. In some industries, a sure way to overcome skepticism includes offering a money back guarantees and simple return policies. 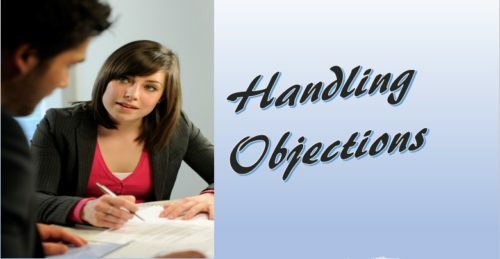 Objection #5: Let me think about it/I need to speak with my partner/manager/etc. Sometimes prospects legitimately need to think about a decision. Or they need to discuss it with someone else. With regards to the latter, ask questions from the beginning to determine if there’s another decision-maker. Best way to put this is “Apart from you who else will be key to deciding this”. And if so, bring that other decision-maker into the conversation earlier so you can “sell” both decision-makers at once (rather than having to do it twice). With regards to the prospect requiring time to consider the decision, better to agree and respect their time. But ask them out of curiosity “What is that they are interested to explore?”. Even a small hint can help you on what aspect they want to think and you can try to address that by follow-up with them while their making that decision. Getting new customers is one of the hardest things a business must do. By considering the objections prospective customer has, and preparing for them (via adjusting your marketing materials and training your sales team), you will more successfully attract new customers. Previous Post What motivates good sales manager?